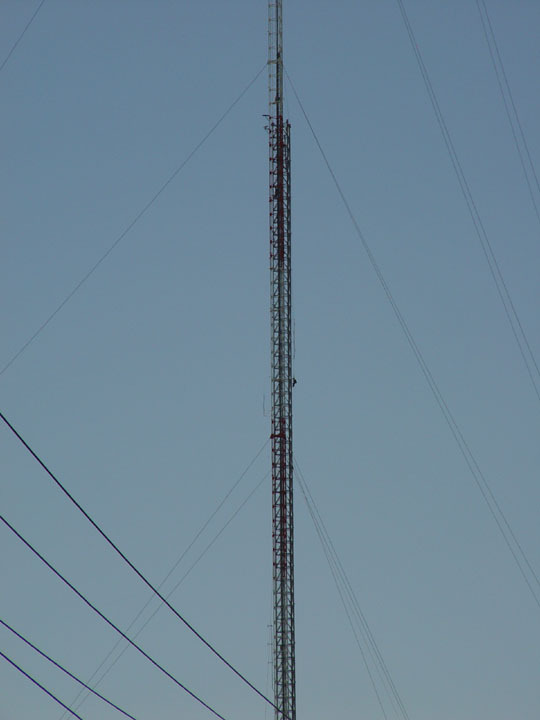 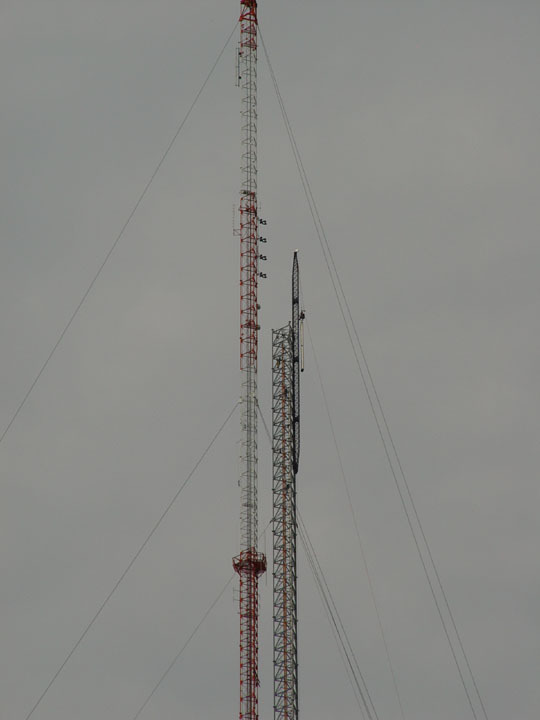 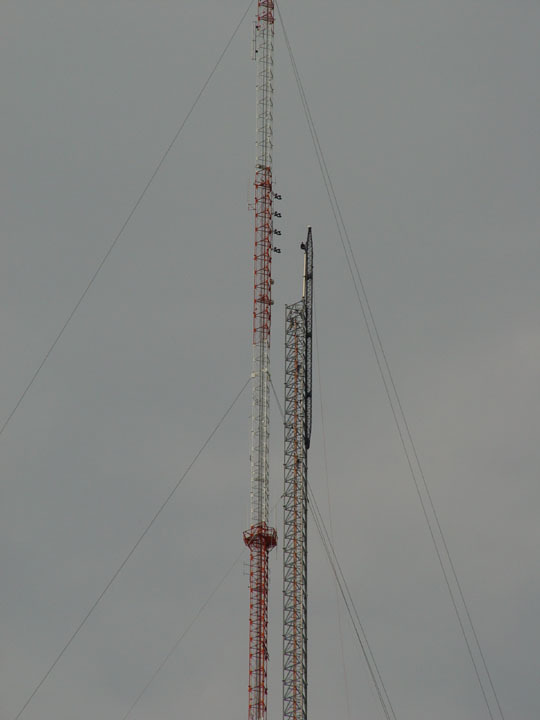 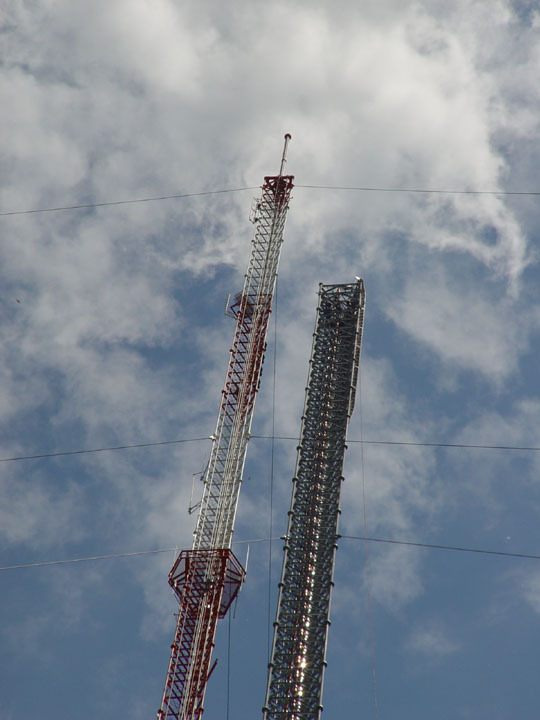 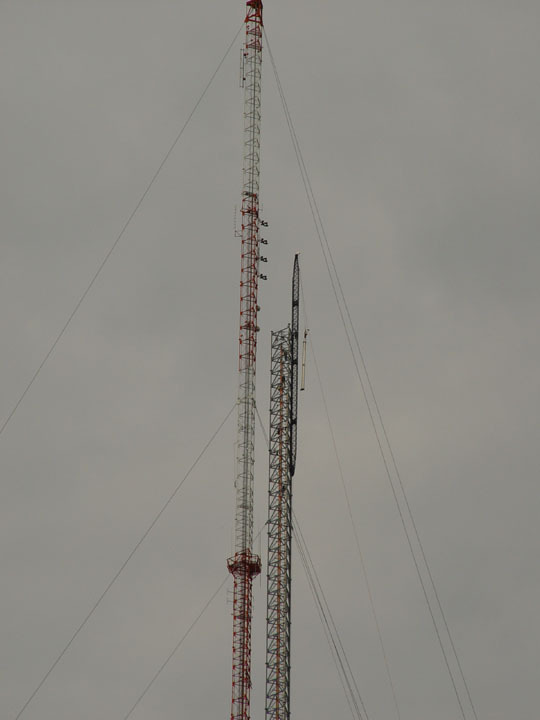 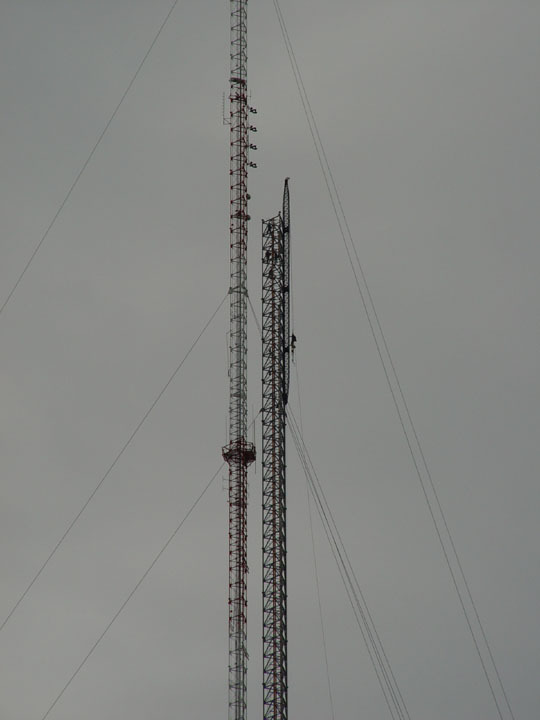 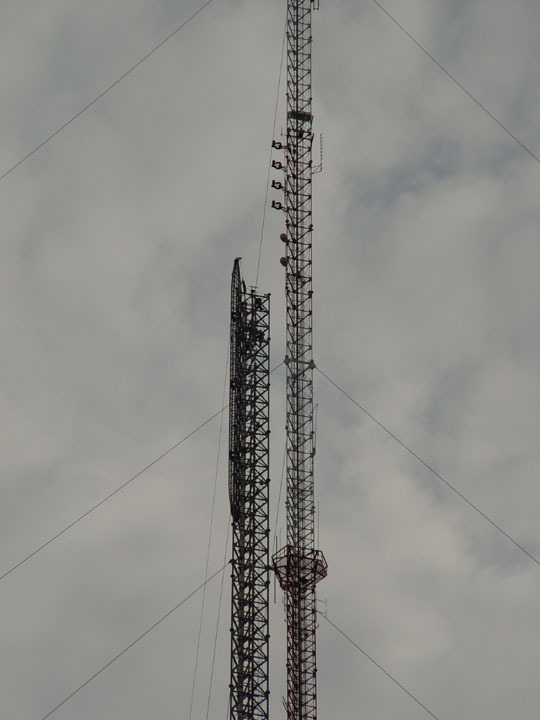 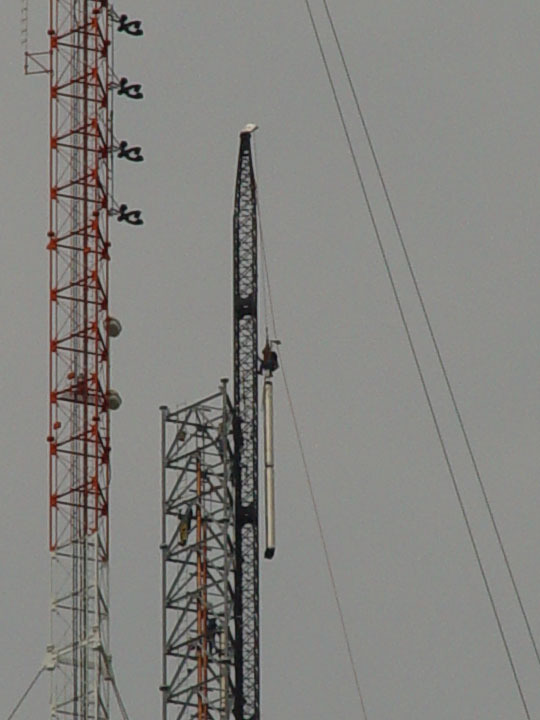 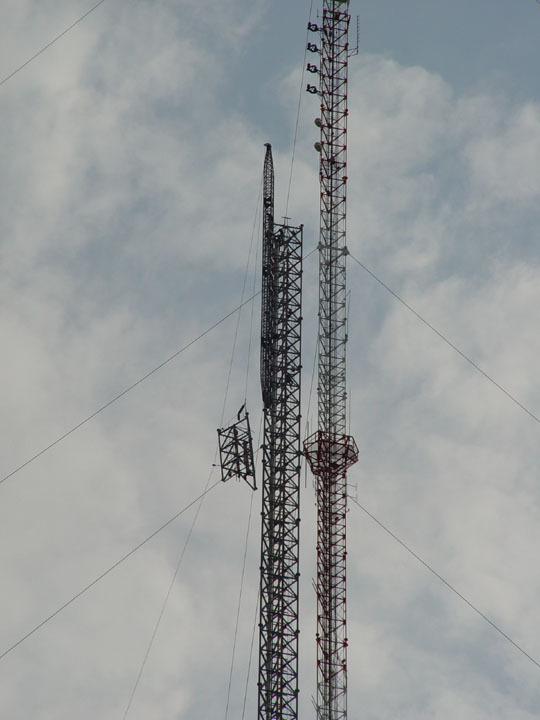 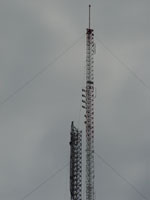 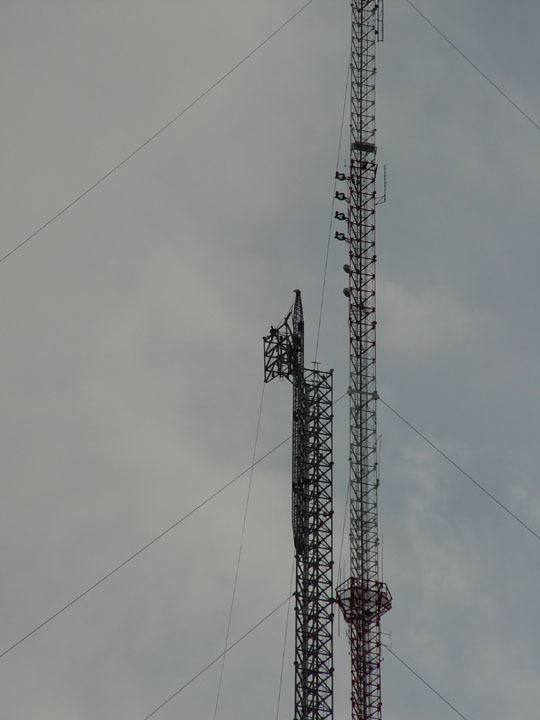 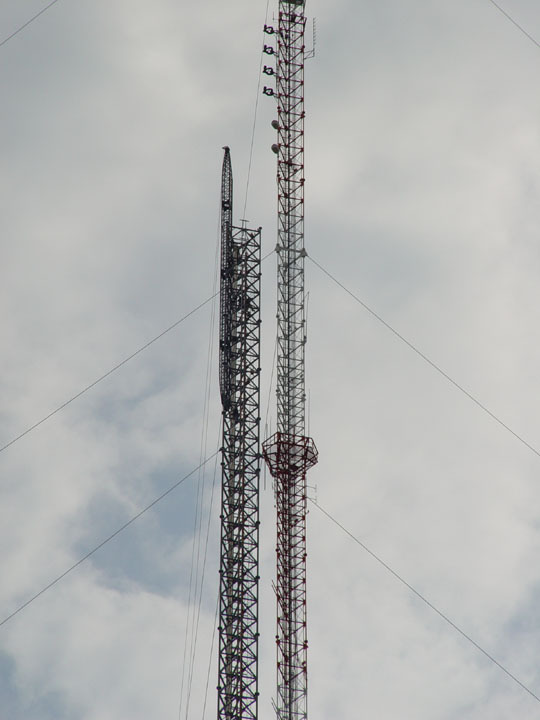 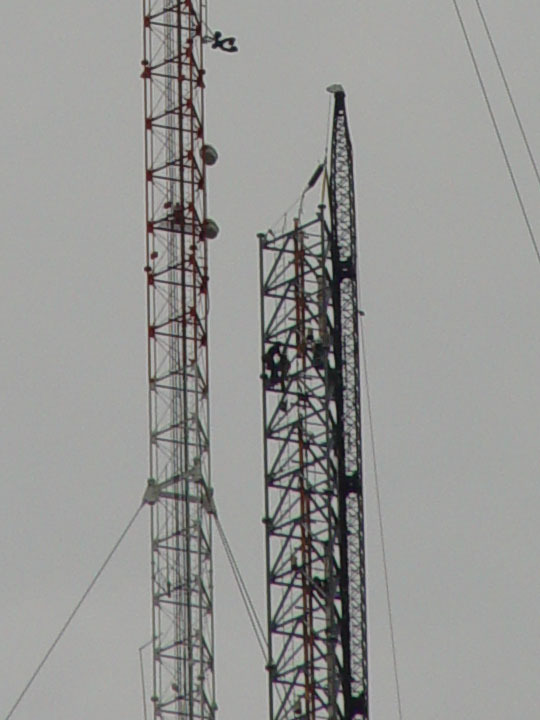 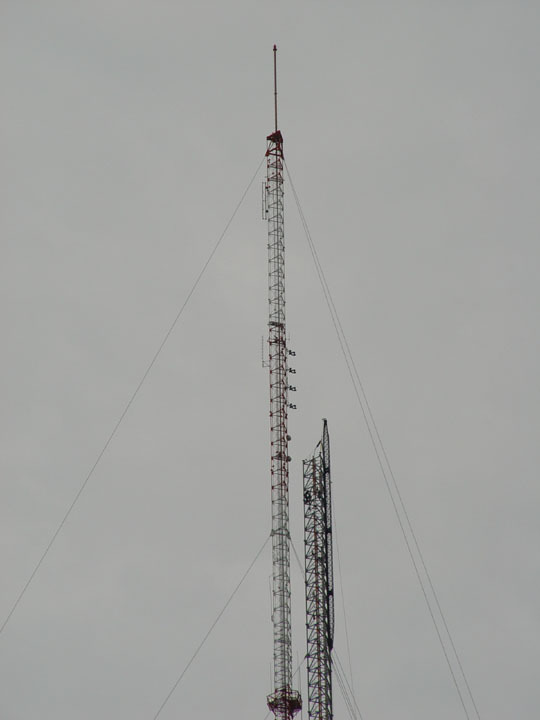 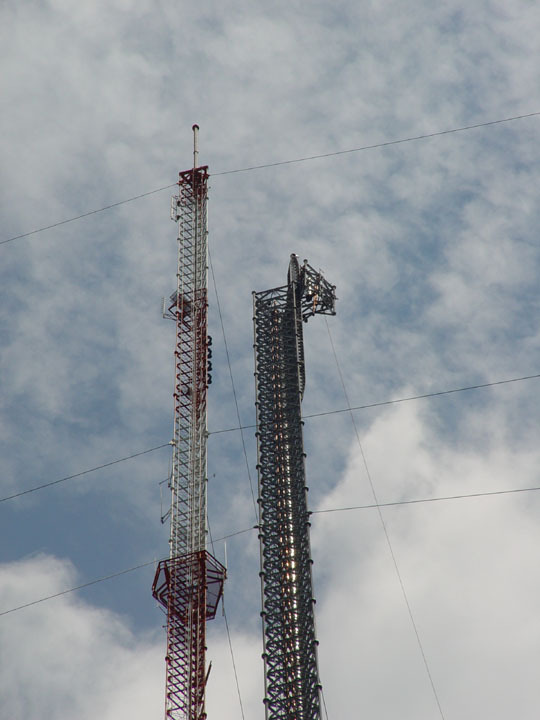 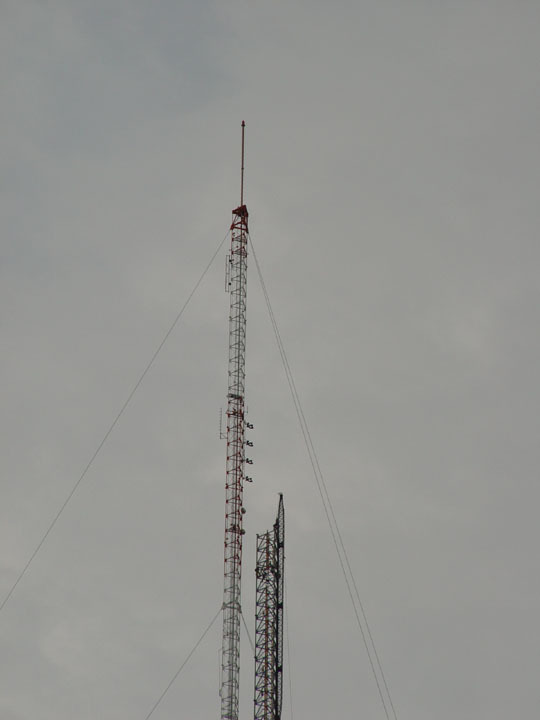 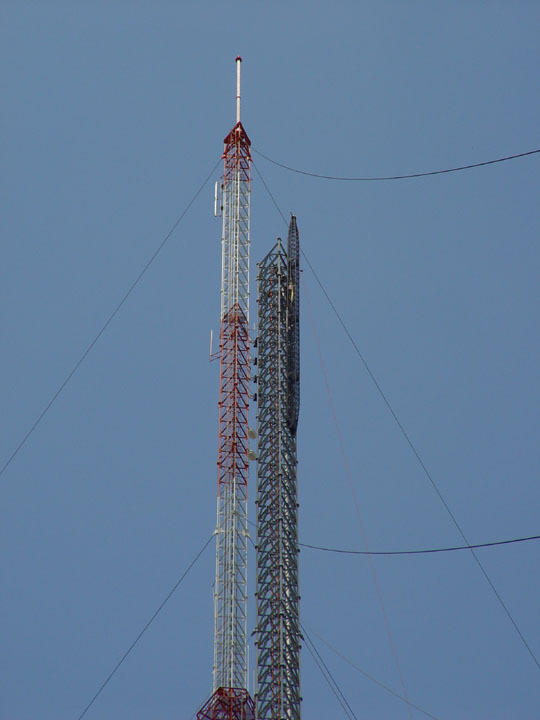 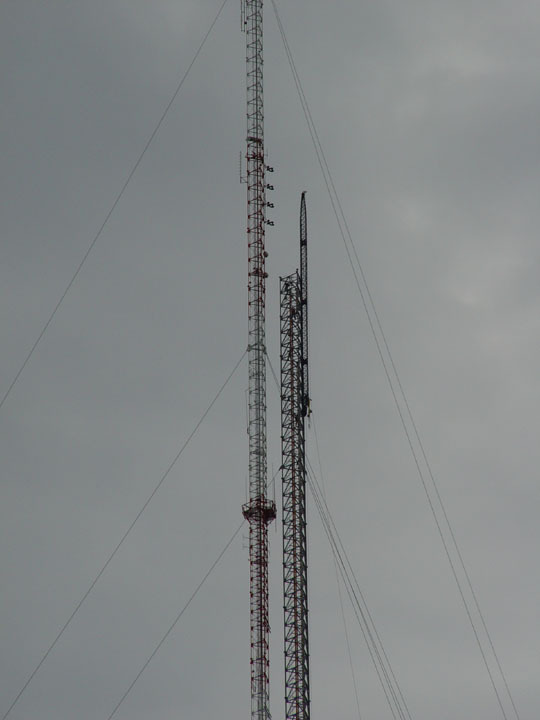 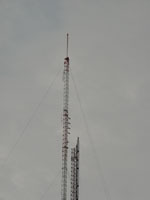 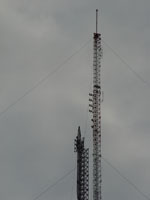 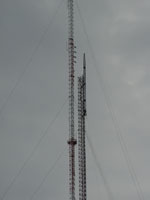 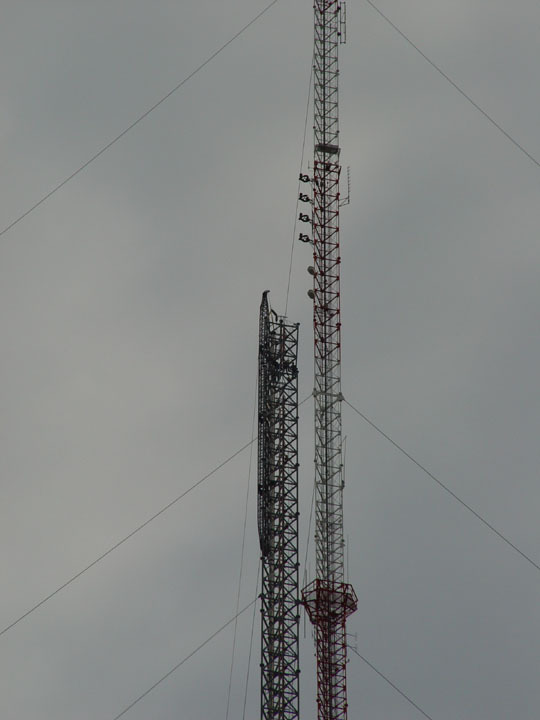 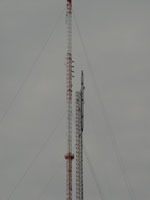 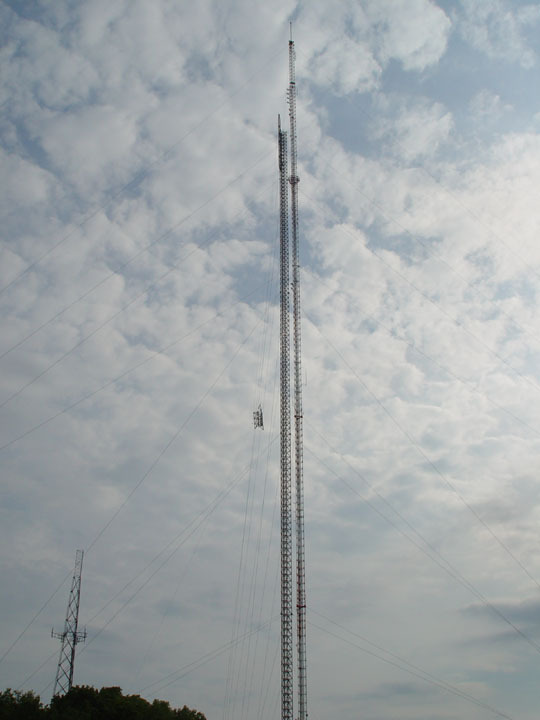 The new tower, when completed, will be 1248 feet, about 200 feet taller than the one it is replacing (without antenna sticks). 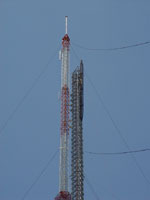 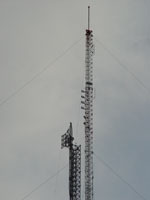 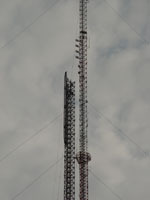 The current tower, with sticks, is 1097 feet and the new tower, with sticks, will be 1299.7 feet. 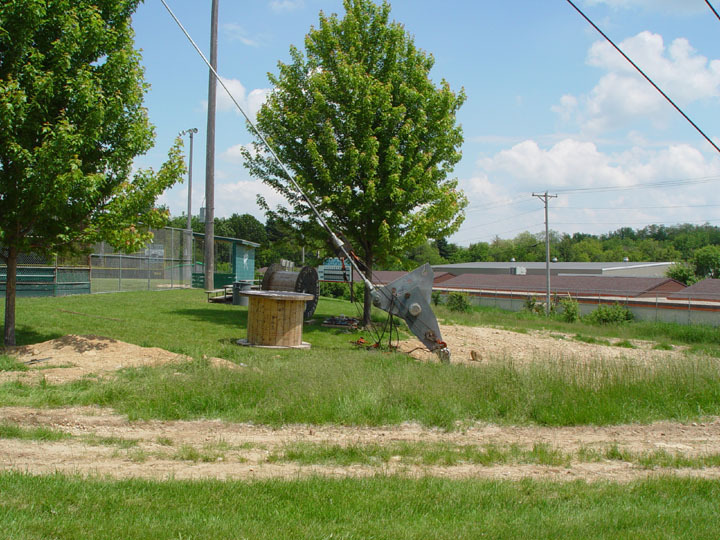 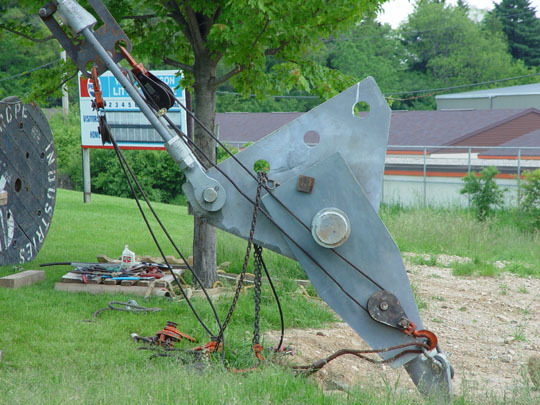 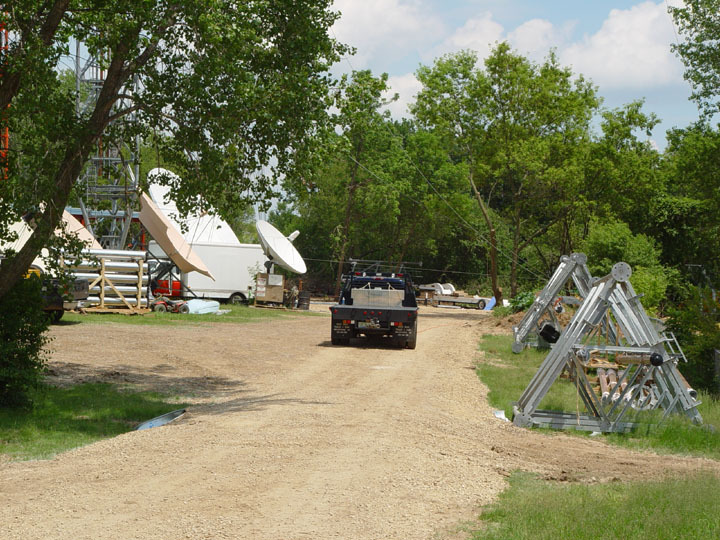 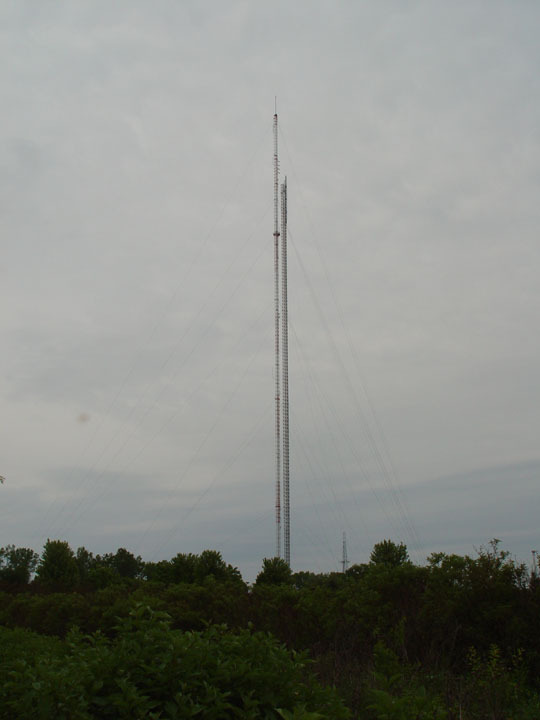 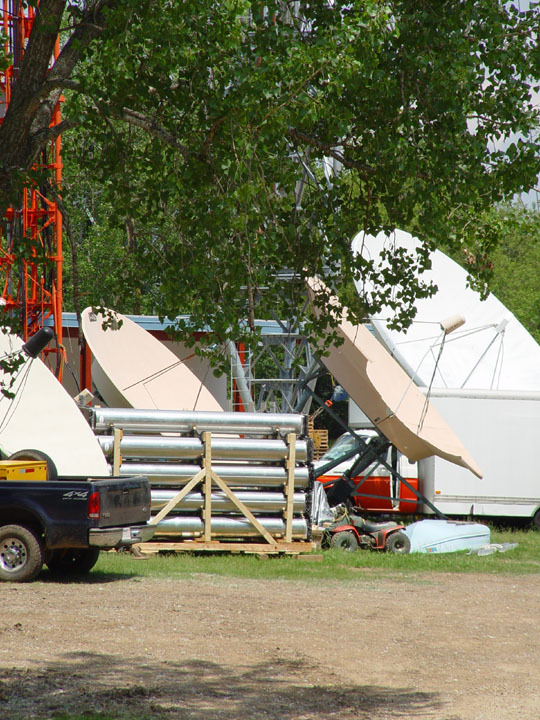 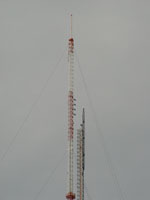 The top of the DTV antenna will be at 1203 feet and the height of the antenna is 39.3 feet. 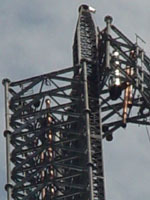 It will be side mounted to the tower. 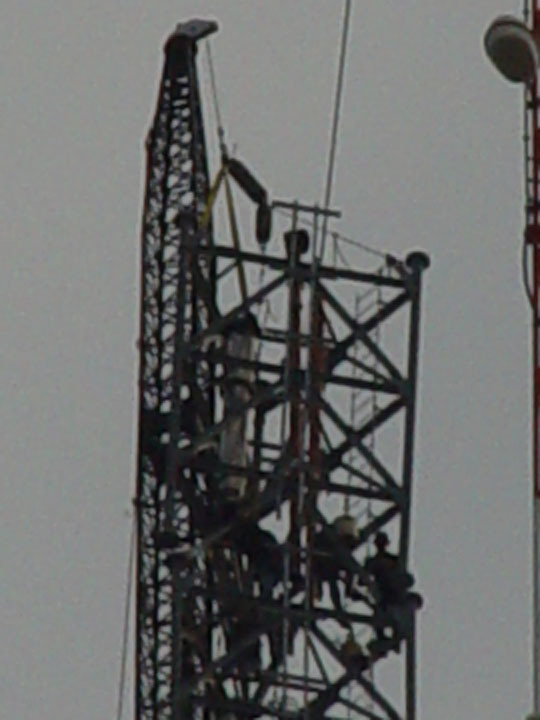 You can see a tower rigger about halfway down the tower. In this view the new tower is behind the old tower. 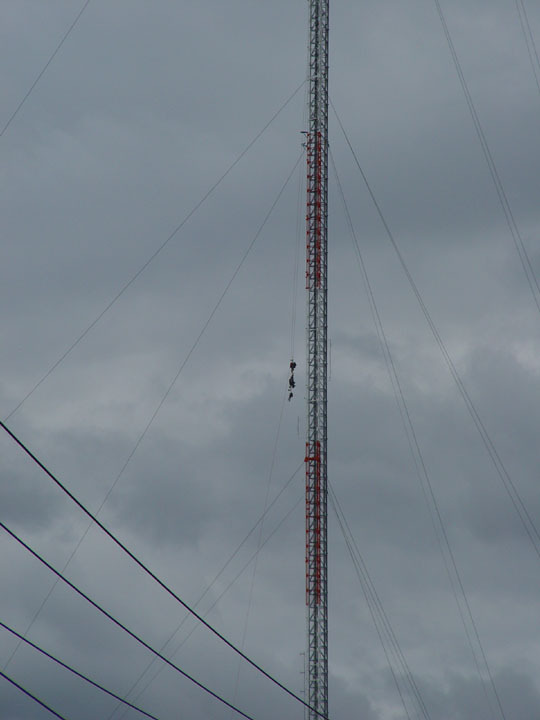 Done for the day, the tower riggers descend. 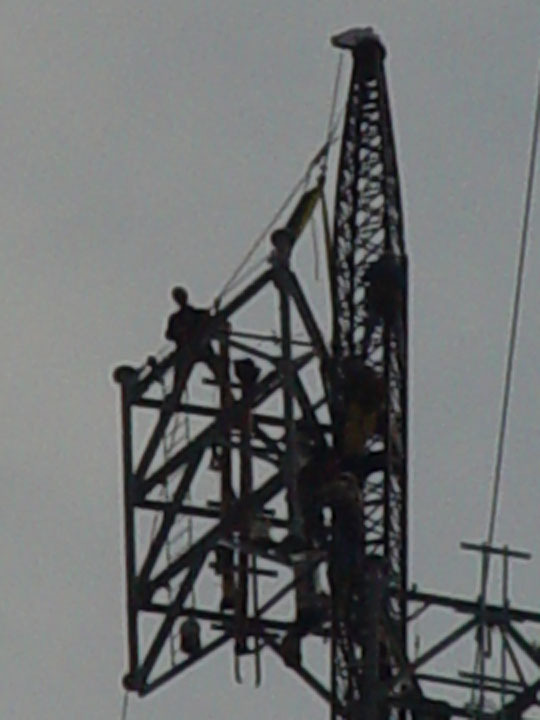 Working on a Saturday. 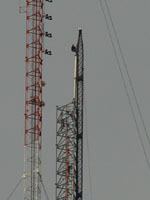 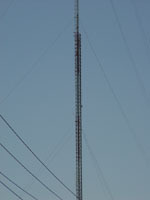 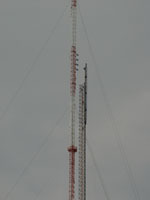 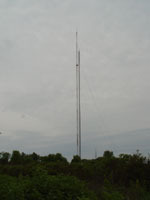 The current tower is about 1000' in height. 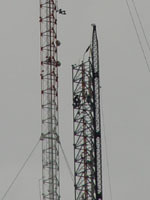 These views are southwest of the towers. 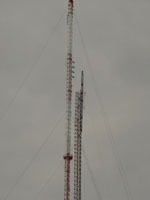 A new section was just placed on the tower. You can see tower riggers in the center of the enlarged view. You can see two of the riggers on the tower. 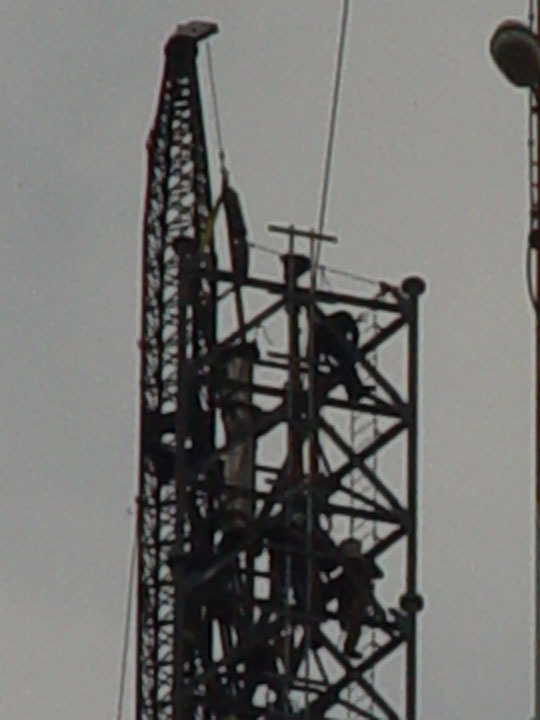 They are working on shifting the crane. 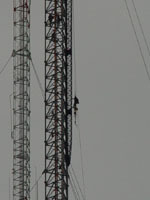 You can see one of them on the right, working on the crane, in this enlarged view. 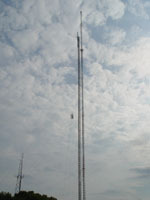 The crane has been lifted to the new position. 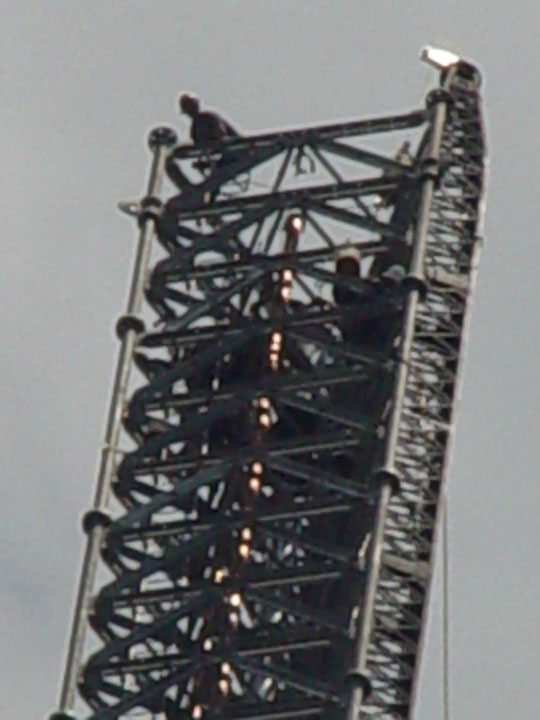 They lift two (assembled into one) of the wave guides. 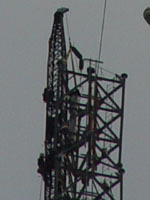 You can see it to the right of the crane. 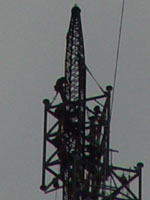 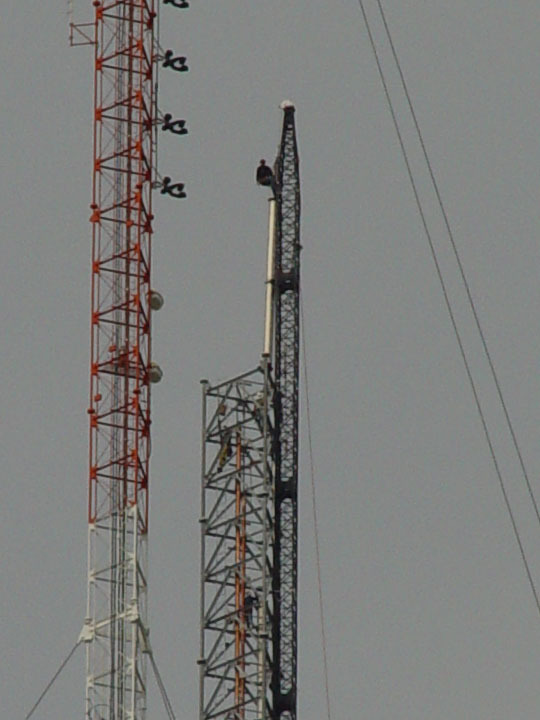 One of the tower riggers climbs on top of the wave guide. 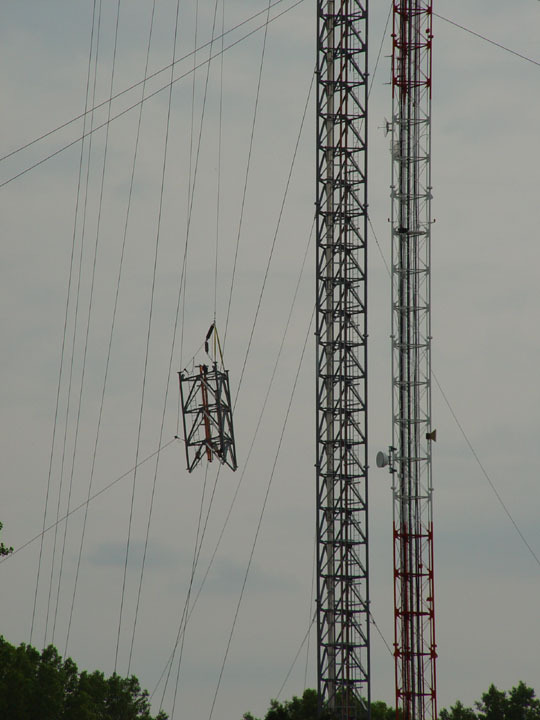 The wave guide is swung around, with the rigger still on top of it. 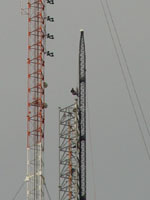 The wave guide is swung into the tower and joined to the top of the existing wave guide. The views are closer and from the northeast side of the towers. 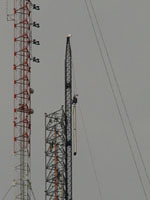 A new section is being lifted into place. 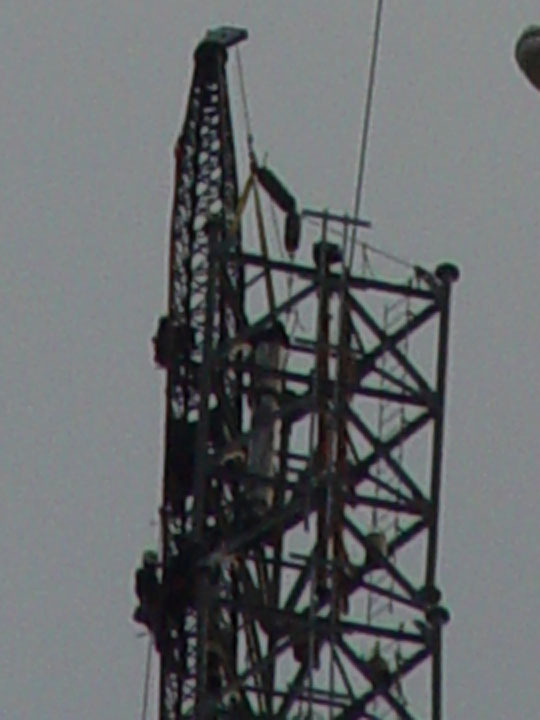 Just short of the crane. 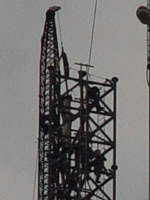 As the section moves to the top of the crane, it can be heard scraping the side of the crane. 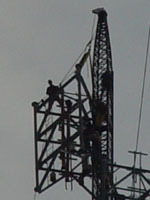 The riggers move the hoist cable so that the section can be swung around. 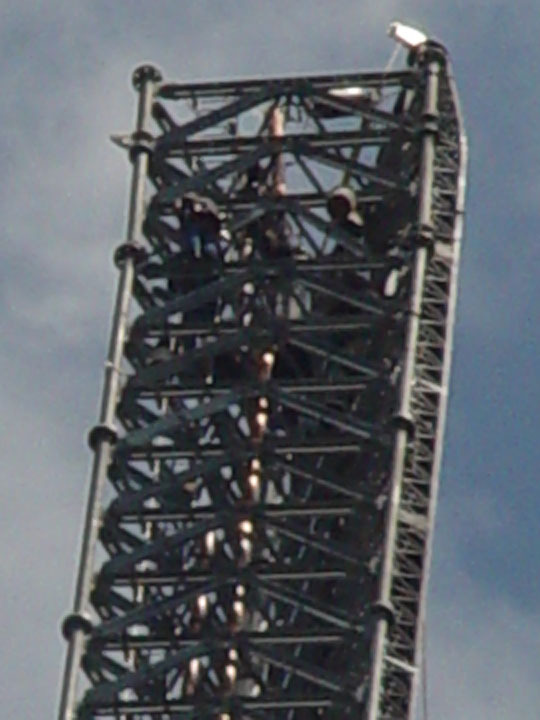 The section is being swung around. 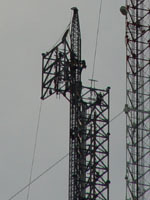 The section is aligned to the tower, one foot at a time. 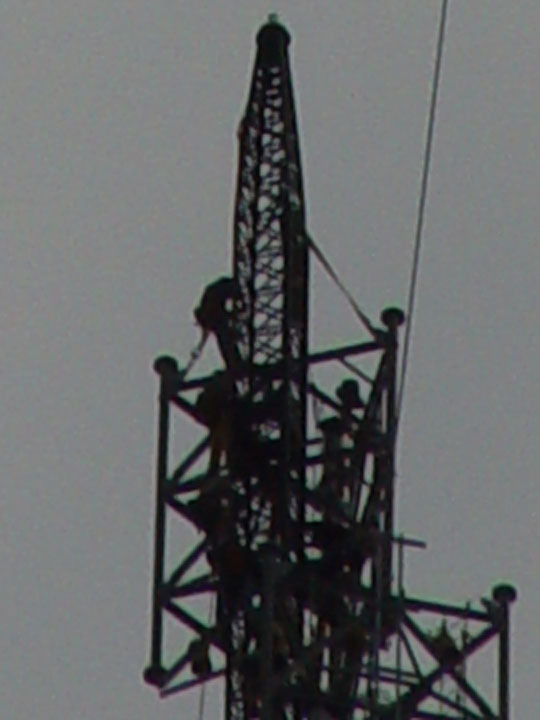 You can see one of the tower riggers working on the first footing. 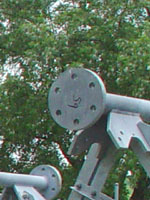 The section is now in place. 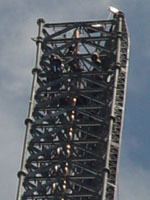 The finale stack of sections. 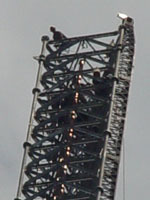 Another section being lifted into place. 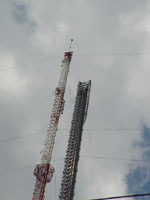 The finale stack of sections, from the other side. 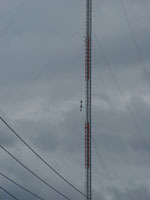 The last piece in this area is marked #59, though 60 is the last section before the T-bar. 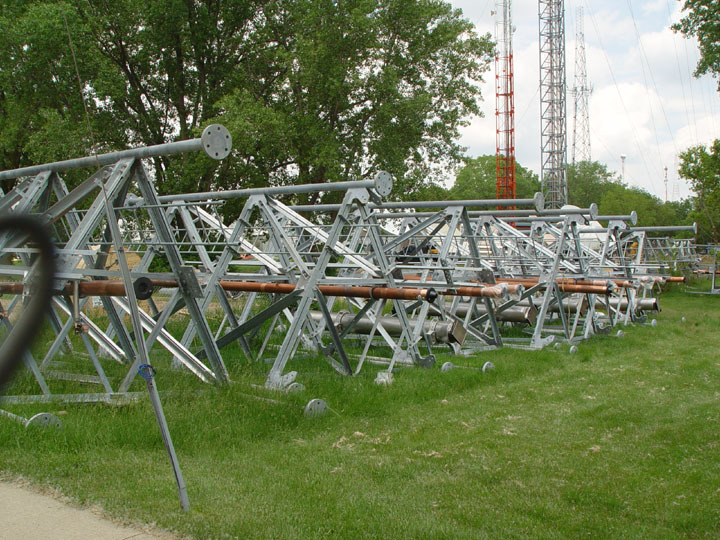 A stack of the cross pieces that have to be added between each section. 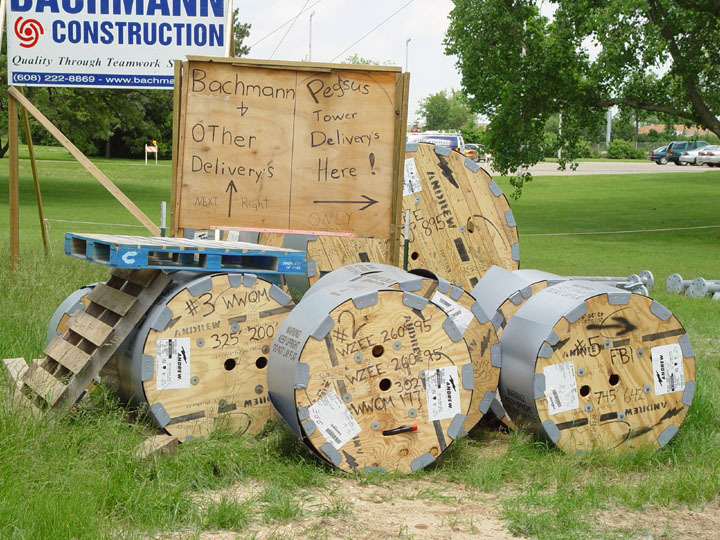 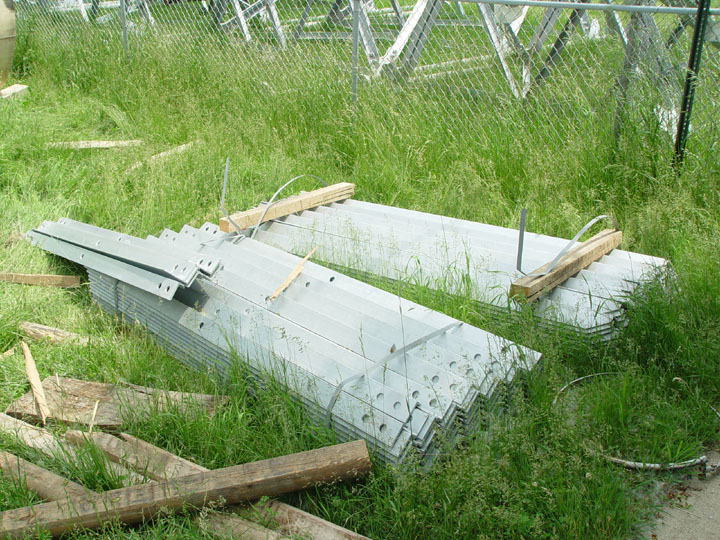 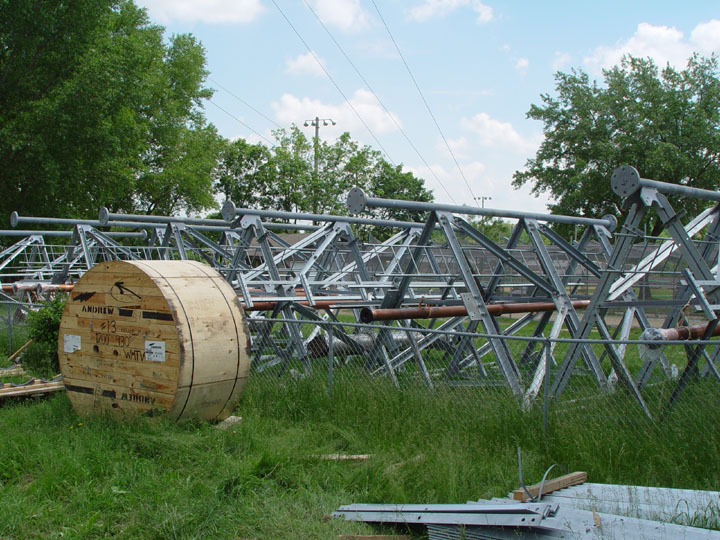 Some of the rolls of antenna feeder cable for radio stations, etc. 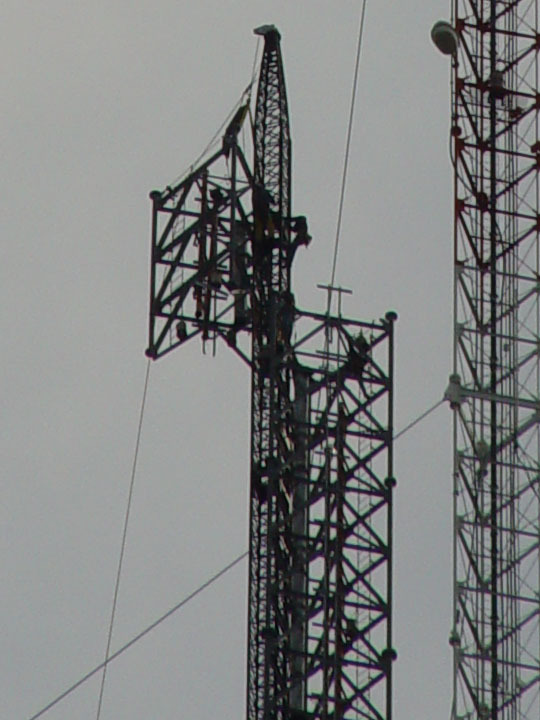 Notice that the one of the right is for the FBI. 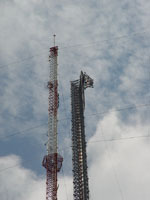 Stack of misc. 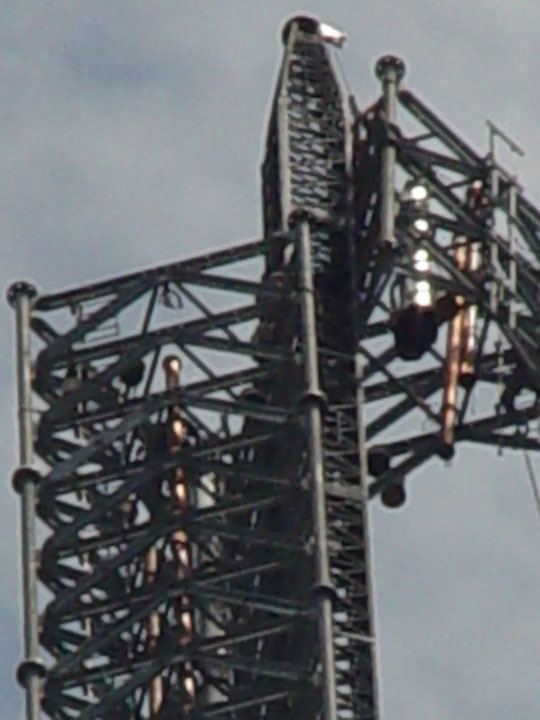 hardware. 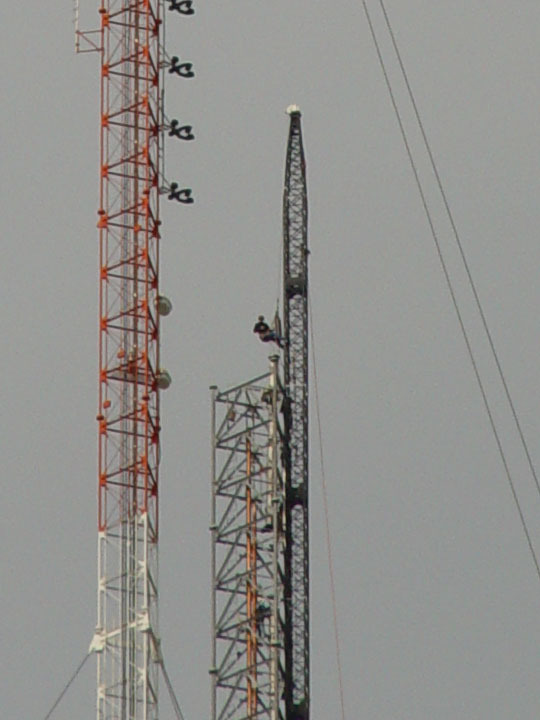 There always has to be stacks of the small stuff. 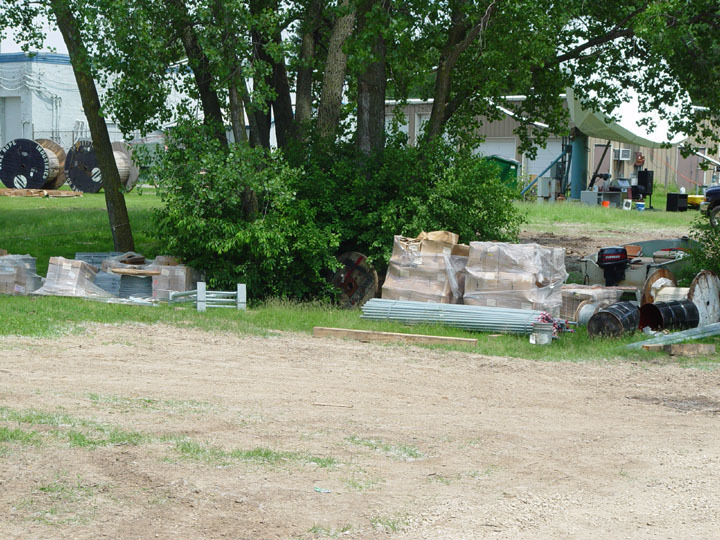 The latest section is in place. 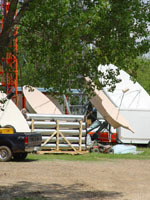 Blowup view. 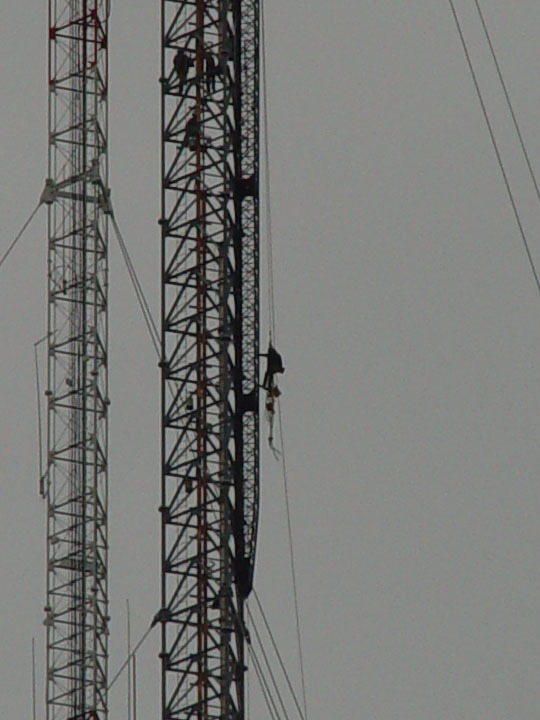 Notice the location where the guy wires will be attached. 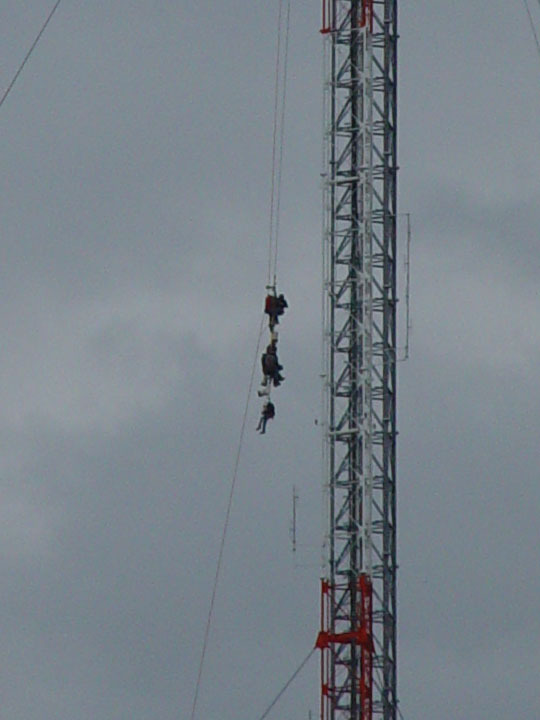 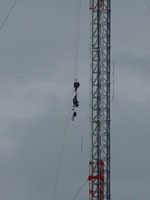 Look carefully and you can see a couple of the tower riggers. 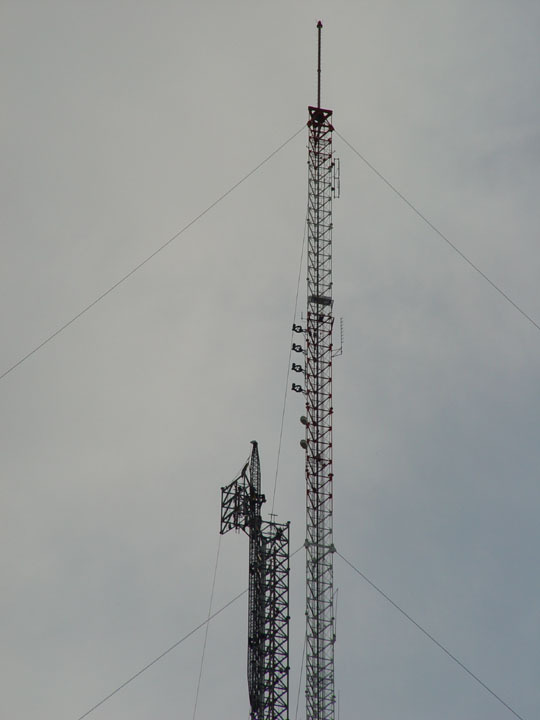 You can see one of the tower riggers looking over the top, which is about 920 feet up at that point. 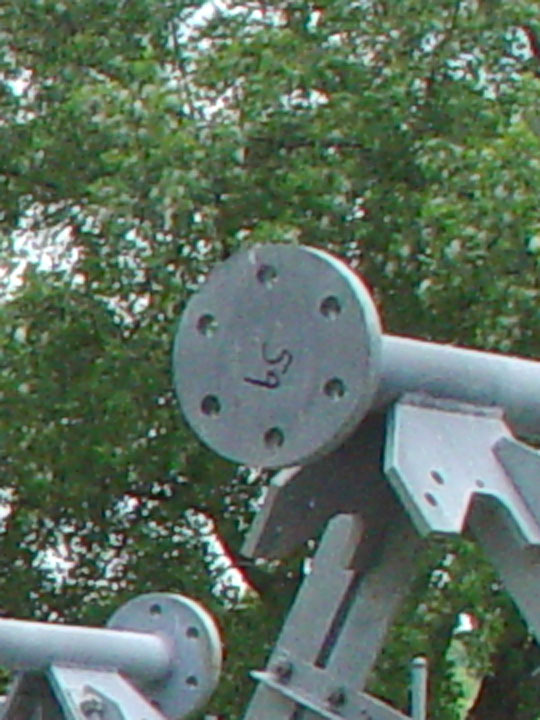 View of one of the upper guy wire anchor posts. Looking toward the towers from the guy wire ground location. Look carefully and you can see the base of the new tower. 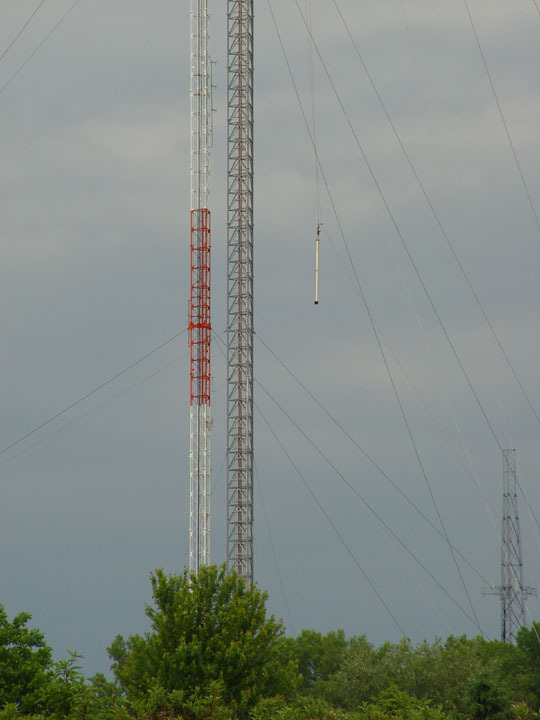 Last modified on Wednesday, 23-Aug-2017 23:19:39 CDT.